I just received my special issue of "Hummingbirds", volume 2 of the Popular Birding Series magazine by the editors of WildBird Magazine. What a treasure! 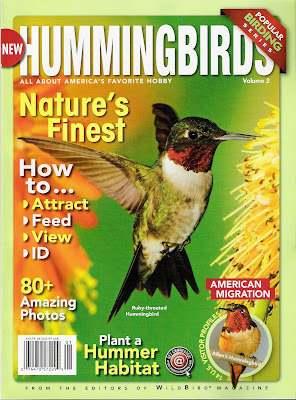 Fantastic photos of all of the hummingbird species you might see in the United States, great descriptions about them, articles about their behavior, how to attract them to your yard, and much more! There's even a little snippet that I submitted that they were kind enough to include. Here is a link to Volume 1 about backyard birding. Volume 2 must be so new that I can't find where to buy it online yet! Sounds like the magazine for me. I'm such a huge hummingbird watcher. So much so, that I'm already looking for a new feeder this year. Have you heard of this hummingbird feeder? I wanted your opinion. I read about the Sphinx moth on p32 and I had never seen one. Yesterday, August 24 I saw one on our butterfly bush. I ran and got a camera and took pictures.